The thirst for ivory is making national headlines, but Secretary Clinton is doing her part to turn up the heat on foreign governments to help stop this senseless slaughter. Tell her thanks and ask her to keep up the good work. Have you seen the grim front page news about elephants these last few days? The world is waking up to the fact that elephants are in crisis. Major news outlets like the New York Times, National Public Radio, and National Geographic are highlighting the escalating violence and organized crime in central Africa and Asia that made 2011 the worst year for elephants in decades. 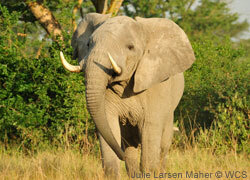 Based on reported elephant slaughters and ivory seizures, 2012 is shaping up to be even worse. Luckily, one of the world's most famous diplomats is standing up for elephants, tigers, rhinoceroses, and other wildlife that are gravely threatened by the illegal wildlife trade. Over the last week, Secretary of State Hillary Rodham Clinton has made illegal wildlife trafficking one of the focal points of her travels through Africa and Asia. Send Secretary Clinton a thank you note for shining a spotlight on this crisis and for her efforts to save wildlife. Saving elephants is a global effort, and we all have a role to play. We need more boots on the ground protecting elephants. We need strict law enforcement measures to punish these criminals. We need to raise public awareness. And we need to step up the pressure on governments to help curb the insatiable demand for illegal ivory. Secretary Clinton is doing her part. This past week, she successfully rallied Asian leaders to pledge to ramp up efforts to combat illegal wildlife trafficking by building capacity, expanding enforcement, and increasing cooperation to make sure everyone is working their hardest to protect national security, economic stability, and precious endangered wildlife. Secretary Clinton, thanks for your tough stance on this issue. We need you to keep turning up the pressure on governments to help end this crisis. The only way this news is going to stay top of mind is if officials in the highest reaches of government like Secretary Clinton continue to put it on their agendas. Let's show them that we're paying attention and like what we see. Thanks for standing with us at this critical moment for elephants.